“I believe you can’t live without a passion in life,” says Wicus Leeuwner, a simple statement which underscores his twin loves – nature and photography. Leeuwner is well-known for the uncanny images in which he captures the essence of the Overberg region, from windswept wheat fields set against azure skies to virgin green grass freckled with sheep. At 62, he considers himself retired, but keeps himself busy supplying curio shops with calendars, postcards, keyrings and fridge magnets which bear his trademark photographs. Thanks to their efforts, the number of blue cranes in the Western Cape has swelled from 600 in 1990 to 12 000 today – a remarkable achievement if you consider that the turnaround has happened in a man-made environment of wheat stubblefields and dryland pastures. Sadly, their numbers in the wild in KwaZulu-Natal and Mpumalanga remain on the decline. After a violent farm attack in 2007, Wicus and his wife Hanlie sold the dairy business and moved to their holiday home in Hermanus, where he gets to indulge in another favourite pastime – shell collecting. 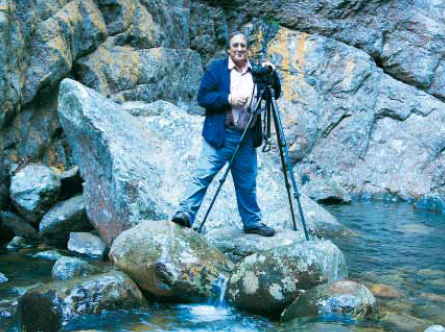 Since then, he has focused his attention to Ziya Fana, his photography business aimed at the tourism market, which takes him to all corners of SA. The name in Xhosa means “just like the real thing”, a compliment he was frequently paid by his former farm labourers. He loves capturing quiver trees against the first light of day and taking images of blazing red boulders in the dramatic landscape at De Toon. “In the Richtersveld I feel there’s a thin veil between reality and another realm,” says Leeuwner, a sentiment which is echoed by his one-time mentor, Canadian photographer Freeman Patterson. “Patterson taught me a new way of looking at life,” admits Leeuwner. “He taught me that the camera looks both ways – it looks at the outside world, but it also reflects the inner world of the photographer.” Evidently it the way he continues to view the natural world to this day. The blue crane population in the Overberg is measured by the bi-annual Coordinated Avifaunal Roadcount (CAR). Farmers, birders and educators alike follow fixed routes through agricultural lands to monitor the numbers of this vulnerable bird. According to CAR, there were 47 blue cranes per 100km in the Overberg 17 years ago compared with 186 birds per 100km today.